First thing’s first: The best moment of Arrow this week wasn’t in tonight’s episode, but in last night’s episode of The Flash, in which we were treated to Neal McDonough reaching the absolute apex of his scenery-chewing glory. Given little more than a cameo, Damien Darhk was stripped down to his essence, which involves killing people, commenting on how much he enjoys killing people, damn near killing the Green Arrow, and honest-to-goodness giggling in amusement when the Flash zips in to save Oliver. It’s such a fun moment for the character and the show in general because there’s no room for narrative flab in such a quick little scene—on the more heroic side of things, the casual introduction of Oliver’s magnetic arrow makes the team look so damn cool—but there’s also room for the show to have fun going in the other direction and stretching itself out, which is what we get here. This year’s crossover between The Flash and Arrow plays out like one big 90-minute movie, with only the perspective shift from Barry to Oliver halfway through giving away the fact that these two stories are playing out on separate shows. We can basically divide “Legends Of Yesterday” into two chunks: the bit that is still setting up the continuing adventures of the Hawks and Vandal Savage in the upcoming Legends Of Tomorrow, and the bit where Oliver finds himself dealing with life inside a Flash storyline. Bringing back Barry’s time-traveling from the first season of The Flash is a clever move for the show, as it plays out like a microcosm of Oliver’s series-long arc. He has long been defined by his struggle to not let his more rash instincts get the better of him, and so many of Oliver’s stories have fundamentally about him trying to earn a second chance with his friends, with his city, and with his life in general. But because he’s spending this week in Barry’s world, sometimes those hard-earned second chances are just handed to him out of nowhere, and he’s quick to make the most of this one when it presents itself. Oliver’s reaction to what Barry has to say illustrates how the two shows weave between which of the two heroes is the more human: Oliver’s training makes him more emotionally distant than the more relatable Barry, yet his lack of superpowers means Oliver is far more straightforward when it comes to cosmic ideas like time travel and resetting timelines. Barry wonders about larger consequences, while Oliver just gets on and sets right what he can. That the crux of this is Oliver’s long-lost son—and one not even named Connor!—is … well, it’s a bit weird, honestly, just as it was weird to see Moira Queen in the “Previously On” segment of last night’s Flash episode. 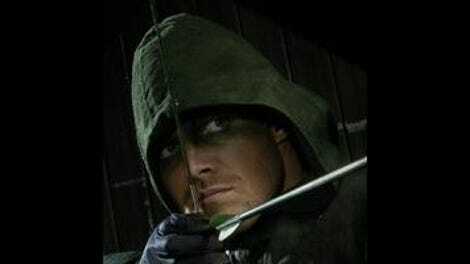 A previously unknown child is one of the most soap opera plots Arrow could conceivably trot out, and the fact that this particular plotline has been sitting on the shelf for two years does it no favors. As I discussed back in the review of “Seeing Red,” that particular subplot never felt like it had all that much to do with Oliver, given his younger self was ignorant about all that was happening, nor did it really establish the mother of Oliver’s child as anything more than a character-building device to help wrap up Moira’s arc. The whole business with Oliver’s child mattered to the show inasmuch as it illustrated Moira’s twisted mix of love and ruthlessness. That’s fine in and of itself, but it means “Legends Of Yesterday” has trouble knowing quite how to grab hold of the story tonight; in particular, Anna Hopkins’ Samantha doesn’t come off particularly sympathetic, because the audience has no context for her that might elicit sympathy. She’s just this person we might vaguely remember from a year ago who ends up making a demand of Oliver that doesn’t seem especially logical in and of itself—how exactly would she expect Oliver to successfully keep a secret of this life-changing magnitude from the woman he loves?—and just feels like a plot-mandated way to drive a wedge between Oliver and Felicity, whether tonight in the first timeline or sometime later, as is now pretty much inevitable. Indeed, Felicity’s breakup with Oliver in the first timeline isn’t wrong, exactly, but Oliver’s also kind of right when he says this has all come out of nowhere, so it’s again difficult for the audience to fully invest in the characters’ sudden, drastic decisions. Where this all works better is in how Oliver approaches his second chance to fight Vandal Savage. Barry is absolutely right when he says that Oliver was distracted the first time around, with the unspoken suggestion that part of Oliver’s great power as a crime-fighter is that very focus; he has come to be able to hold his own among metahumans and mystics because he knows exactly what he wants to achieve at any given moment. “Legends Of Yesterday” underlines a point the show has often made about how Oliver—and this is true for Barry, too, but it’s not his show tonight—is torn between wanting to keep his friends safe and recognizing how much he needs them to stand any chance of victory. As this episode’s time traveling suggests, Oliver’s overprotective streak might sometimes have well-intentioned roots, but too often it’s just him lashing out and dismissing the value of others. It’s a very particular breed of masochism, really. Either way, the steps Oliver takes to avert disaster the second time around are nicely thought out—for those who like to get meta, the difference between his two approaches could be seen as an acknowledgment of how much better the show’s entire dynamic is this season compared with last year—with a particular tip of the hat to his basically ordering Cisco to go talk to Kendra. Oliver giving romantic “advice” to anyone is a hell of a thing to see. Which brings us round to all the parts of this episode that have the least to do with Arrow. 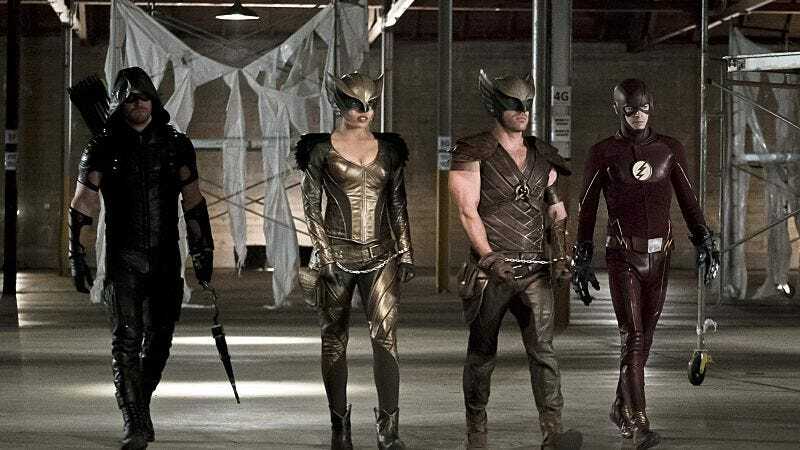 The decision to streamline the origin stories of the Hawks and Vandal Savage so that they all start life 4,000 years ago in Egypt is probably a smart one—I mean, there’s no more notoriously tangled, convoluted backstory in all comics than that of Hawkman and Hawkgirl, so, yeah, any narrative pruning is a good idea—though I’ll admit to some disappointment that the show apparently jettisoned the caveman aspect of Vandal Savage’s origins, if only because such ancient primitivism makes his modern appearance all the more striking. (Also, the name “Vandal Savage” makes a hell of a lot more sense for a caveman than it does an Egyptian priest, but let’s not pretend that’s somehow the one unacceptably implausible thing here.) The flashbacks to ancient Egypt do at least affirm the meteorite-aided aspect of Savage’s immortality, and that need to kill Carter and Kendra—or Koufu and Shayera, whichever you prefer—every few decades makes him a more immediate threat than if he were immortal without any restrictions. The show is smart too about bringing in Malcolm to make it clear just how enigmatic, and thus how terrifying, Vandal Savage really is, though that’s one hell of a sudden but inevitable betrayal the episode ends on. As for Carter and Kendra, they are just the latest in a long line of heroes on both Arrow and The Flash to skip town the very moment their arcs might become narratively inconvenient. (I mean, I’d name previous examples, but it’s literally the cast list for Legends Of Tomorrow, give or take Barry’s dad, so let’s not act as if this is all that surprising or worth getting too worked up over.) The best thing Arrow does with them here is to contrast Kendra’s two training sessions, with Carter’s appeals to ancient rage proving inadequate but Cisco’s more human, emotionally intelligent advice being all Kendra needs to reconnect with Shayera. It’s odd to say that the non-Oliver character who is best served by tonight’s Arrow is a secondary character from The Flash, but then the two shows really are one big happy family for this week. (Well, sometimes happy.) As a grand, almost cinematic event, it’s hard to argue too much with the charms of “Legends Of Today” and “Legends Of Yesterday,” both of which operate on a more epic scale than typical individual episodes of either show. Sure, there’s creakiness here, particularly in how the show reintroduces the largely forgotten thing about Oliver’s son and how it strains one more time to set up the latest spin-off. But for all those real faults, the overall effect of this crossover two-parter is pretty damn impressive. This team-up story is grand enough to be more than the sum of its parts. Casper Crump is quite good as Vandal Savage, and I can see him proving an effective adversary on Legends Of Tomorrow. But I’ll admit, as a Justice League fan, it’s really hard for me to not want Vandal Savage to be an urbane caveman played by Phil Morris. Like Clancy Brown as Lex Luthor, Powers Boothe as Gorilla Grodd, and Michael Ironside as Darkseid, he was just perfect for that role, and honestly could probably have played the part in live-action if not for the fact that, you know, Arrow and The Flash want to be their own things. Annoying how they insist on that, honestly. I’m going to assume Damien Darhk didn’t show up tonight because even Vandal Savage is terrified of him. Tremble before the McDonough, and all that. Felicity is many kinds of nerd, but I’m a little surprised she’s a nerd with recall of random tidbits from Egyptian history. Not that I don’t respect it.